There is no doubt as to the push that Tesla has given the current automotive transition to electric vehicles (EVs). As the company's mission statement outlines, it hopes "to accelerate the advent of sustainable transport by bringing compelling mass market electric cars to market as soon as possible." Previous announcements of billion-dollar investments in battery factories by Volkswagen were largely brushed off by investors as deflections from their ‘Dieselgate' scandal. But with LG and Panasonic in the picture, concrete plans appear to be crystalizing. Combined with Daimler putting US$550 million into tripling its battery production capacity in Germany, Nissan's planned investments in the UK for its third generation Leaf, and GM's joint venture with LG Chem to produce batteries in Holland, Michigan, for its Volt and Bolt, it is clear that auto manufactures are beginning to shift to electric—and in a very big way. "Looking at the full picture here, the future demand for lithium is truly staggering," says Michael Kobler, CEO and director of American Lithium Corp., one of the ambitious new explorers shaking up the lithium mining scene in Nevada. While future demand from the automotive industry is significant, the real game changer for the lithium industry may be electrical grid storage. Grid storage is designed on a variety of scales, each with a different price point. Already price-competitive with diesel fuel for stand-alone renewables and remote locations, home storage applications with devices like Tesla's powerwall, and grid frequency modulation applications are now making major inroads in the grid storage market. 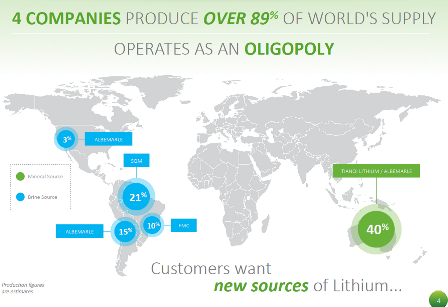 Up until two years ago, the so-called "big three – Albermarle (NYSE:ALB) in Chile and Nevada; SQM (NYSE:SQM) in Chile; FMC (NYSE:FMC) in Argentina – controlled 89% of the world's lithium production. This group of lithium players has recently evolved into the "big five," as Sichuan Tianqi and Ganfeng in China have become significant players. This also ignores fundamental production challenges within the "big five" itself. Albermarle has had significant difficulties with its brine expansion that will most likely contribute to decreased production in 2016. In fact, SQM is the only "big 3" producer with a clear strategy for future growth, with partnerships such as its recent 50% acquisition of an Argentinian Lithium Americas Corporation property (TSX:LAC), which could prove to be successful years for down the road. The timing of the Orocobre and Galaxy developments have eased the price increases in the near term. This combined with the old adage "sell in May and walk away" for prospective companies have sent many juniors sideways or downwards since May. With the consistent long-term demand trajectory, two mines coming into operation provide a significant buying opportunity for those looking to enter the lithium market. "Battery demand is rising at the rate of 1-2 new lithium mines per year, growing to 2-3 mines per year by 2020, and current demand will not only absorb all new mine developments in the pipeline, but will require fresh high quality deposits to be investigated for development," says American Lithium's Kobler. American Lithium raised capital in early May 2016 and bought prospective brine land in Nevada USA on a previously operating Boron mine in late May 2016. Since the start of the year, the lithium industry has gained access to over $330 million in funding, whether from private placements, government grants, stock options, or other investment vehicles. The summer drilling season is upon us, and any lithium junior that doesn't have a drilling program in place by this time is simply not worth looking at. Buying land in highly prospective areas is easy; completing a successful drill program with results takes more expertise. With Albermarle's new mine in Nevada and Tesla's forecast 2018 demand of between 25,000 and 35,000 TPA, the U.S. Southwest is becoming a new hotbed for the lithium industry.